On May 4, 2018, Trump revealed the "American Patients First" Plan. He blamed higher drug prices on everyone from companies to consumers. He wants to reform the rebates drug companies pay to pharmacy benefit managers. They negotiate prices between drug manufacturers, pharmacies, and health insurance companies. The rebates create incentives for PBMs to suggest higher-cost drugs. PBMs are also allowed to charge insurers more than they're charging pharmacies. As a result, everyone pays different prices for drugs. Another campaign promise was to allow consumers to purchase drugs overseas. The competition would have driven down drug prices. So far, this isn't in Trump's plan. But he does want to peg U.S. drug prices to lower international levels. In March 2017, Trump announced he wanted to allow Medicare to negotiate lower prescription drug prices with pharmaceutical companies. It never happened, either. To do this, the U.S. Congress would have had to amend the act that established Medicare Part D. It prohibited Medicare from negotiating. Drug companies said they needed that protection to provide funds for research and development of new cures. The Congressional Budget Office found that Medicare wouldn't save much by negotiating. Health insurance companies already do a lot of negotiation. On December 22, 2017, President Trump signed the Tax Cuts and Jobs Act. It repeals in 2019 the Obamacare tax on those who don't get health insurance. It removes the incentive for healthy people to get insurance. The CBO estimated 13 million people would drop coverage as a result. Health care costs will rise because there will be fewer healthy people paying premiums. Health insurance companies will be left with just the sicker people. Removal of the mandate means fewer people will get preventive care or treatment for chronic diseases. That will worsen health care inequality. People without insurance use expensive emergency rooms as a substitute for primary care. That increases costs up for everyone. One study forecasts that premiums will rise between 35 and 94 percent over three years. Parts of the South and Midwest will bear the brunt of the price hikes. The Trump administration has taken many steps to weaken the ACA even without repealing and replacing it. But it hasn't worked. As of the first quarter of 2018, insurers reported better financial performance than at any time since the ACA was enacted. They've only requested modest premium increases. Enrollment has remained steady. On October 12, 2017, President Trump stopped reimbursing insurers who waived deductibles and copayments for 6 million low-income customers. He blamed Congress for not appropriating the funds to cover these ACA subsidies. A study showed that the subsidy allowed insurance companies to cover 3.2 million people. They would, in turn, provide enough revenue to lower premiums for everyone by 20-40 percent. Once Trump stopped the reimbursements, insurance companies said they must raise customers' premiums by 20 percent. To keep them in the exchanges, states had to approve the rate increases. For example, Kentucky, Mississippi, and Virginia approved a 25 percent rate increase. The ACA subsidies would cover those increases for many people. But that adds to the deficit. The Congressional Budget Office estimates Trump's move to stop reimbursements will cost the government at least $194 billion over the next 10 years. On February 20, 2018, the administration proposed a plan to loosen regulations on short-term insurance. As Trump stated in his October 2017 executive order, he wants to allow short-term policies to last up to a year. The Obama administration capped them at 90 days. Short-term plans cost less but don’t offer as many benefits. Since these plans are attractive to young, healthy people, the change will likely cause a rise in premiums for comprehensive plans. On January 11, 2018, the Trump administration allowed states to impose work requirements on Medicaid recipients. At least 10 states asked for this permission. They will cut off benefits for “able-bodied” recipients unless they have a job, are caregivers, or are in school. The requirement won't affect 95 percent of Medicaid recipients. Sixty percent are either younger than 18 or older than 65. Another 25 percent already work. At least 10 percent are either disabled, caregivers, or students. The requirement targets the small percentage of childless single adults to whom the ACA expanded benefits. The administration encouraged states to submit waivers that make other Medicaid changes. For example, states asked to charge Medicaid recipients premiums. Some wish to limit the time recipients can receive benefits. Others want mandatory drug testing. First, the order directed the Secretary of Labor to expand access to association health plans. These are policies made available to trade groups, small businesses, and other associations. The order expanded the types of groups that can form these health plans. It also prohibited them from refusing coverage or charging more to those with pre-existing conditions. It would allow people on association health plans to buy policies in other states. The order fulfilled a campaign promise to allow health insurance companies to sell policies across state lines. Each state has specific regulations. That makes it expensive for national insurance companies to operate in different states. As a result, five companies service half the insured population. Increased competition should reduce these companies' monopoly power and lower costs. But the executive order might do the opposite. The big companies are the only ones with the clout to operate across state lines under the current policy. If it becomes even easier for them to do so, they would raise prices. Even more frightening is that the new policies wouldn't be as closely regulated. The administration would exempt them from the Affordable Care Act's rules and state licenses. As a result, the plans wouldn't have to offer the ACA's 10 essential benefits. They could reimpose lifetime and annual limits. These plans might look like they did in the early 1990s. They left 398,000 people with $123 million in unpaid claims. If this rule took effect, it could drive people away from the insurance offered on the exchanges. They would flock to the lower-cost association plans, even though they offer fewer benefits. The ACA-compliant plans would be stuck with the sickest people. That's like asking auto insurance companies to insure only those who have been in car accidents. This would force insurance companies to raise rates or drop out of the exchanges. The order could also affect those with company-sponsored plans. The ACA allows employers to choose a coverage plan from any state. That didn't matter when the ACA mandated all plans to have the same benefits. But employers might flock to the new plans with fewer benefits because they cost less. In October 2018, the administration allowed ACA subsidies to be used to buy such plans. States must file a "1332 waiver" that shows people still have access to at least one comprehensive health plan. States must also coverage rates wouldn’t decline. This will weaken the coverage used by most people, who will gravitate toward the cheaper plans. On July 7, 2018, the Trump administration announced it would suspend at least $10.4 billion in "risk adjustment" payments to insurers. Since 2013, the government payments have cushioned the blow for insurers who wound up with an unfair proportion of unhealthy enrollees. This can happen to insurance companies who are in states with a higher proportion of elderly residents, for example. Without the subsidy, insurers will raise rates. The administration was reacting to a court decision that said the payment formula was faulty. 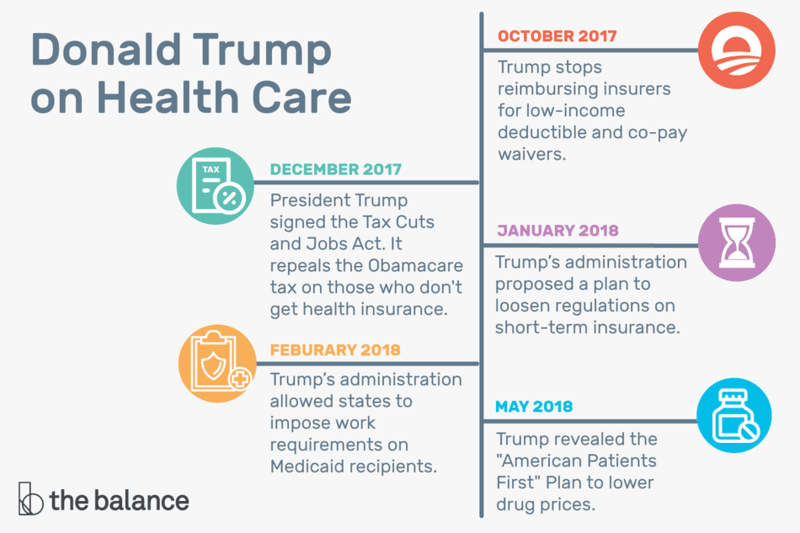 On October 17, 2017, Senators Lamar Alexander, R-Tenn., and Patty Murray, D-Wash., announced a bipartisan deal to save Obamacare after Trump stopped reimbursing insurers who waived costs for low-income people. The Alexander-Murray deal would have continued the subsidies until 2019. It tried to restore $106 million to promote the health insurance exchanges. Insurers could offer catastrophic plans to those 30 or older. It loosened the requirements for states to receive so-called 1332 waivers. It required insurance policies to cover Obamacare's 10 essential benefits without raising prices for those with pre-existing conditions. On September 22, 2017, the Trump administration announced it would close the health insurance exchanges for 12 hours on the first day of open enrollment, November 1, 2017. It would shut down the exchanges from midnight to noon for “maintenance outages” every Sunday of open enrollment except for December 10, 2017. The Trump administration cut funding and personnel needed to help people enroll. It cut $5 million in advertising. It also posted negative messages about the ACA on YouTube and Twitter. Still, 8.7 million people signed up for coverage in the 39 states on the federal exchange. It was 0.5 million less than in 2016. The president directed the Internal Revenue Service to allow people to slide by if they don't get insurance. In his first 100 days, President Trump signed an executive order to "ease the burden" of Obamacare. It directed agencies to do what they could within the existing law to lift the ACA regulations. If you have a chronic illness, your costs will rise. You'll have to rely on the ACA plans on the exchanges. As healthy customers leave those plans, the companies will raise prices to remain profitable. In May 2018, Maryland health insurers asked for an average 30 percent increase in premiums for that very reason. Hospital groups oppose Trumps' plans for specific reasons. They don't want their emergency room costs to increase. They realize that would happen once preventive care under expanded Medicaid is withdrawn. In the past, Trump has mentioned the following two ideas, but they are not in any current plans. 2. Offer a universal “market-based” plan. Trump originally wanted to provide a range of choices similar to the Federal Employees Health Benefits Program. In 2016, he suggested expanding Medicare. That's what was in Obama's original health care reform plan. Many are opposed to universal coverage, especially if they see it as a sign of socialism. That was one reason for the failure of Hillarycare. To understand the ACA better, see my book, "The Ultimate Obamacare Handbook."